Nero, was the son of Cn. 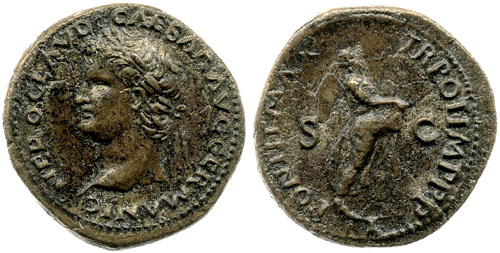 Domitius Ahenobarbus, and of Agrippina, daughter of Germanicus, and sister of Caligula. Nero's original name was L. Domitius Ahenobarbus, but after the marriage of his mother with her uncle, the Emperor Claudius, he was called Nero Claudius Caesar Drusus Germanicus. 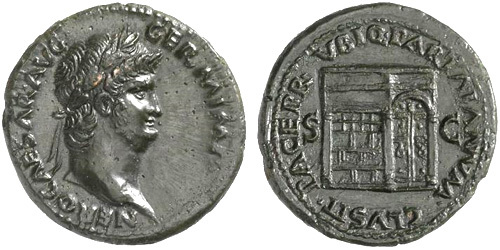 Obverse: NERO CLAVD CAESAR AVG GERMANI, Radiate head right. 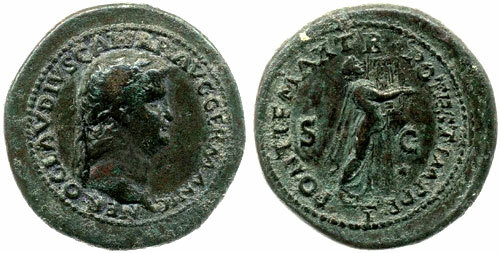 Reverse: PONTIF MAX TR P IMP P P S-C I, Nero, as Apollo Citharoedus, advancing right, singing and playing lyre. Reverse: PONTIF MAX TR POT IMP P P S-C I, Nero as Apollo Citharoedus in flowing robes advancing right playing Lyre held in left hand. Obverse: NERO CLAVDIVS CAESAR AVG GERMANIC, Laureate head right. Obverse: NERO CLAVDIVS CAESAR AVG GERMANIC, Radiate head of Nero to right. Obverse: NERO CLAVDIVS CAESAR AVG GERMANIC, Laureate head of Nero to right. Reverse: PONTIF MAX TR POTEST IMP P P S-C I, Nero as Apollo Citharoedus in flowing robes advancing right playing Lyre held in left hand. Obverse: NERO CLAVD CAESAR AVG GER P M TR P IMP P P, Laureate head right. 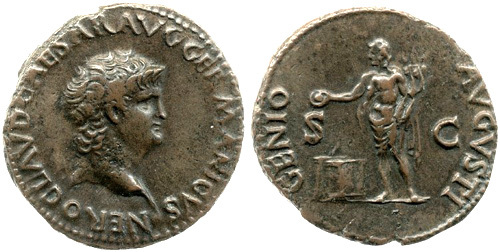 Reverse: GENIO AVGVSTI S-C I, Genius standing left, sacrificing out of patera over lighted altar and holding cornucopia. Obverse: NERO CLAVG CAESAR AVG GER P M TR P IMP P P, radiate head right. Obverse: NERO CLAVD CAESAR AVG GERM P M TR P IMP P, Laureate head right. Obverse: NERO CAESAR AVG GERM IMP, laureate head right. Reverse: PACE P R TERRA MARIQ PARTA IANVM CLVSIT S-C ,View of one front of the temple of Janus, with latticed window to left and garland hung across closed double doors to right. Reverse: PACE P R TERRA MARIQ PARTA IANVM CLVSIT S-C, View of one front of the temple of Janus, with latticed window to right and garland hung across closed double doors to left. Reverse: PACE P R VBIQ PARTA IANVM CLVSIT S-C, View of one front of the temple of Janus, with latticed window to left and garland hung across closed double doors to right. Reverse: PACE P R VBIQ PARTA IANVM CLVSIT S-C, View of one front of the temple of Janus, with latticed window to right and garland hung across closed double doors to left. Reverse: S-C, Victory flying left, holding in both hands shield inscribed SPQR. 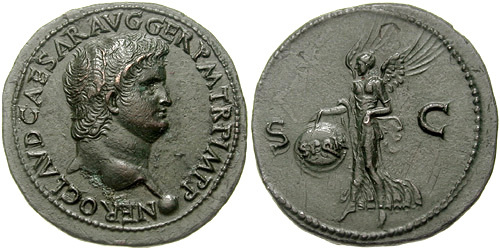 Obverse: IMP NERO CAESAR AVG GERM, Radiate bust to left. Obverse: NERO CLAVD CAESAR AVG GERMANI, laureate head right, globe at point of bust. Reverse: PONTIF MAX TR POT IMP P P S-C I, Nero, as Apollo Citharoedus, advancing right, in flowing robes, playing the lyre. Obverse: NERO CLAVD CAESAR AVG GERMANI Laureate head right, globe at point of bust. 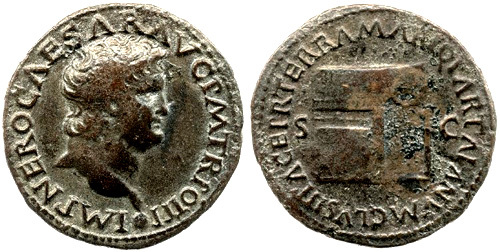 Reverse: GENIO AVGVSTI S-C I, Genius, waist draped, standing half-left, sacrificing from patera over lighted altar with right hand and holding cornucopia in left hand. Obverse: NERO CLAVD CAESAR AVG GERMANIC, Laureate head left. Obverse: NERO CLAVD CAESAR AVG GERMANICV, bare head right, globe at point of bust. 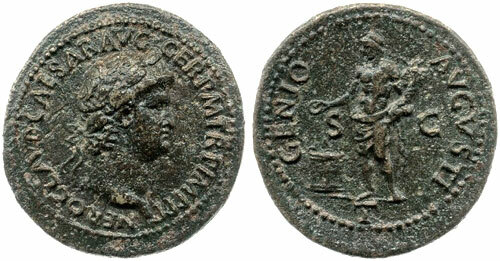 Reverse: PONTIF MAX TR POT IMP P P S-C, Nero, as Apollo Citharoedus, advancing right in flying robes, playing lyre. Obverse: NERO CLAVD CAESAR AVG GERMANICVS, Bare head right, globe at point of bust. Obverse: NERO CLAVD CAESAR AVG GERMANICVS, Bare head left, globe at point of neck. 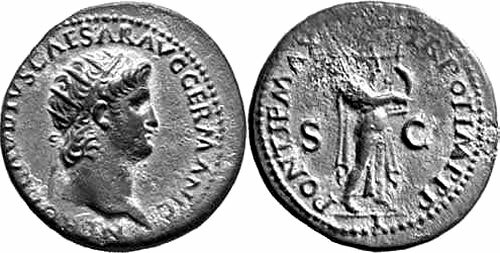 Reverse: GENIO AVGVSTI S-C, Genius, waist draped, standing half-left, sacrificing from patera over lighted altar with right hand and holding cornucopia in left hand. Obverse: NERO CLAVD CAESAR AVG GER P M TR P IMP P, bare head left, globe at point of bust. Reverse: PONTIF MAX TR POT IMP P P S-C, Nero as Apollo Citharoedus standing right, with lyre. 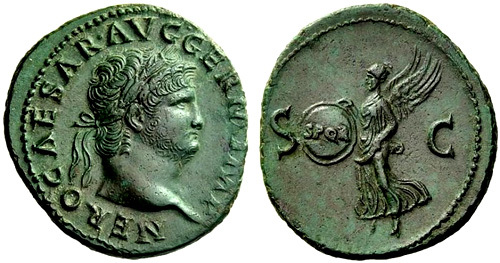 Obverse: NERO CLAVD CAESAR AVG GER P M TR P IMP P, Bare head right, with globe at point of bust. Reverse: ARA PACIS S-C, Altar enclosure with ornamented top, decorated front panels and central double doors. Obverse: NERO CLAVD CAESAR AVG GER P M TR P IMP P P, Bare head right, globe at point of bust. Obverse: NERO CLAVD CAESAR AVG GER P M TR P IMP P P, Bare head left, with globe at point of bust. Obverse: NERO CLAVD CAESAR AVG GER P M TR P IMP, Bare head left, with globe at point of bust. Reverse: PACE P R TERRA MARIQ PARTA IANVM CLVSIT S-C, View of one front of the temple of Janus, with latticed window to left and garland hung across double doors to right. Reverse: S-C, Victory flying left, holding shield inscribed S P Q R.
Obverse: IMP NERO CAESAR AVG P M TR POT P P, bare head right, globe at point of bust. Obverse: IMP NERO CAESAR AVG P MAX TR P P P, bare head right, globe at point of bust. Obverse: IMP NERO CAESAR AVG P MAX TR P P P, Bare head left, globe at point of bust. Obverse: IMP NERO CAESAR AVG P MAX TR POT P P, Bare head right, globe at point of bust. Obverse: IMP NERO CAESAR AVG P MAX TR POT P P, bare head left, globe at point of bust. Obverse: NERO CAESAR AVG GERM IMP, Laureate head left.